For dies that require high precision such as those for telecommunications and electronic equipment, we use a measurement microscope to measure and check whether it is produced according to design after production. The measurement microscope is equipped with an additional measurement function for observing metals microscopically, and a long stroke capable of measuring a maximum of 400x200mm and taking high precision measurements less than (2.2+0.02L) μm in the X and Y axes. , we use the state-of-the-art systems to improve efficiency and implement thorough quality control. 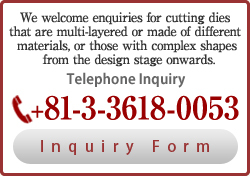 in making cutting dies for various products, from precision machines such as electronic devices and cameras, to telecommunications equipment and electrical appliances from major manufacturers.